A high performance reliable compact hand-held hot air welder for extra precise welding applications and fine feature welding (very similar to the Triac-S digital hand welder). 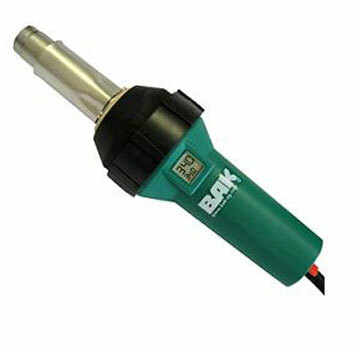 The BAK Digital Rion welder is 120VAC 60 Hz, 1600 watts, and provides outstanding temperature control, ease of use using a step-less digital temperature control from 20 to 650C and an air flow of 250L/minute. Digital read out of BOTH set and actual temperature. Closed loop control circuit automatically adjusts and maintains to set temperature. Precise control for the most any application. Standard Triac tips also fit. 30MM WIDE X 2MM HOT-AIR WELDING NOZZLE, 15 GREED ANGLED. STAINLESS STEEL. FITS ALL POPULAR HOT AIR ROOFING WELDERS. PRICE/EACH.